Reshape your body in record time with Fitness Made Simple’s 45Min FAT BURNING WORKOUT. Workout at home with Fitness Celebrity John Basedow doing specifically targeted exercises to sculpt your chest, back, shoulders arms, legs, and abs. Taped on location in a picturesque botanical garden, the 45Min FAT BURNING WORKOUT overcomes limitations of purely aerobic videos by actually helping men and women change their body composition…shifting it more in favor of lean mass or muscle while decreasing body fat percentage. “Aerobics are great for losing weight to a degree but if you have a “pear-shaped” body, for instance, the best purely aerobic training may do is turn you into a smaller “pear.” Someone with a big “spare tire” may decrease the size of the “spare” but that’s it. 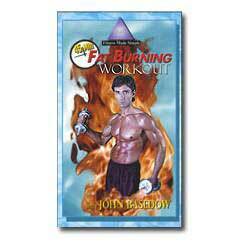 The 45Min FAT BURNING WORKOUT takes us to the next level. The goal of this workout is to stimulate muscle growth and maximize fat burning so we get a leaner, more toned physique. There are no tricky dance moves, no high impact gyrations; instead, this video combines light weight training exercises at a heart pumping cardio pace to shape us up by increasing muscle and burning pounds of fat. 1. You burn some fat just by regularly doing the exercises. 2. The lean muscle you build helps increase metabolism. Muscle tissue is metabolically active and burns fat just to exist...even when you’re at rest. By regularly following the FMS 45Min FAT BURNING WORKOUT you’re priming your bodies to better burn fat 24 hours a day...every day...365 days a year...even while you’re sleeping! On this video you workout together with John...starting out with the major muscle groups...chest, back, and legs...then go on to the smaller ones...shoulders and arms...and finally end with a definition-increasing ab workout so guys can get that tight six pack they’re usually after and ladies can get a lean, toned midsection. You’ll do some "superset" exercises which combine back-to-back sets of 2 or more exercises without rest periods between them to stimulate muscle growth and also keep your heart rate up so you get a good cardio workout as well to maximize fat burning. As with many of our home-style videos convenience is key to making exercise a part of our lives...so the FMS 45Min FAT BURNING WORKOUT requires very little equipment...only a couple of free weights (dumbbells) and a bench. All of the exercises can be done right at home so you don’t have to get dressed-up, drive to the gym, worry about who you’re going to run into, or do anything other than focus on the great results you’re going to get from this program.